HomeFront Page News Articles - Public Visable Exhibitions Borderline Exhibitions Front Page Blog Another Borderline Winner! 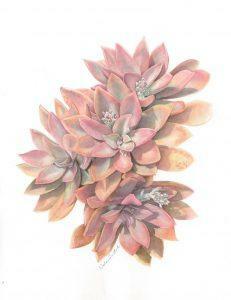 We just heard that Nola Sindel’s watercolour painting “Graptoveria Big Brother” won the Peoples’ Choice award at the recent Botanical Art Society of Australia exhibition in Sydney at the Botanical Gardens. Also, Anni Washington and Nola will have entries at the Daphne Young Watercolour Prize in Armidale in October.